Today is a good day to review your earnings and expenses and start thinking about taking charge of your financial security. The Queens are represented as Goddesses in this deck and Pentacles refer to Earth signs, all of which are powerfully referenced in this card. 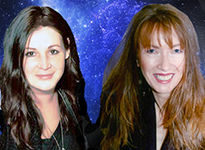 There’s a mystical and magical element to the Goddesses in the Secret Language of the Birds tarot. Goddesses — which are actually a step up from the Queens in traditional tarot — are portrayed as shape-shifter entities, a hybrid between bird and human. Notice the Owl latching onto the Goddess’s shoulder in this card, and even drawing blood. 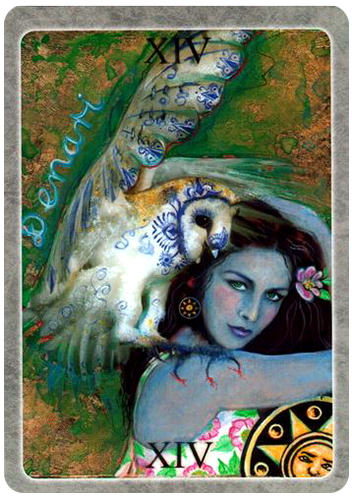 Owls are known for wisdom, caution and observation — qualities which are tantamount to the Queen of Pentacles archetype. She is practical, earthy and careful — not just with her possessions but also her need for security and self-preservation. The Sun face on the coin in the bottom corner of the card (and the smaller version dangling from her ear) reminds us of the importance of financial security. The flower behind her ear (and on her dress) remind us that beauty and sensuality are key components to her happiness and well-being. The Goddess of Pentacles does need to be grounded. And she does need to feel that she’s contributing to her future and her financial security. But the shape-shifter qualities of the owl remind her that there’s so much more to life than wealth and success. You can work and earn and save to your heart’s content, but if you don’t take the time to stop and smell the flowers you won’t feel fulfilled. While you don’t want to spend foolishly or indiscriminately, you have to allow yourself to enjoy it or it will never be enough. This beautiful card is part of the Secret Language of Birds Tarot series by Adele Nozedar (author) and Linda Sutton (artist). Distributed by Schiffer Publishing. * The Court cards in this deck replace traditional Pages with Queens and traditional Queens with Goddesses. This interpretation correlates the number XIV with Queens. We are available for phone or chat through the Click4Advisor links above. If we’re not showing as available you can request a call-back or schedule a session. If you’d prefer a flat rate session (for a reduced fee), click on the “About Us” page in the Menu above for other payment options. We look forward to Speaking with you!